New York Comic Con might seem like a three-day escape from reality, but for many people it’s more than just entertainment. People go into NYCC ready to share intimate moments of their past and present with other attendees as well as artists they’ve dreamed of meeting. It’s become a yearly ritual for many, an exciting gateway for newcomers, and a profitable way for local and small business artists to connect with fans. NYCC has been serving up justice inside the Jacob K. Javits Convention Center since 2006. The event is the East Coast response to the original three-day mega con in San Diego, , and has become its own celebration of community, individualism, and consumerism. Today, comic conventions of all sizes are successfully presented from coast to coast, offering up local heroes in pop culture alongside superstars that champion the pages and screens of comics and action flicks worldwide. After reports that this year’s NYCC celebrated record-breaking attendance with over 200,000 fans, it goes without saying that the days of ostracizing geeks and nerds for their hobbies and lifestyles are over. Sub-genres like sci-fi, fantasy, and horror have been permanently incorporated into mainstream media, seeping into billion dollar industries such as tech and fashion. NYCC programming reflects this with events that cater to comic fanatics, fans and enthusiasts. Since the start of NYCC, the convention has hosted special guests like Marvel’s Stan Lee, and Star Wars royalty and acclaimed author, Carrie Fisher. One of this year’s most anticipated events was “25 Years of Fears: Goosebumps with R. L. Stine,” a sold out panel and meet-and-greet with the beloved author of the Goosebumps book series. Readers from six to sixty showed up with books in hand, ready for Stine’s prized signature. I personally enjoyed NYCC’s local touch, as I shook hands with established small-business artists like Tara McPherson and eagerly waited in line to reconnect with Mondo, a collective of pop-culture printmakers from Austin, TX. For decades, creators and consumers of nerdy pop culture have pushed the limits of storytelling in various mediums which helps foster comradery between audiences across the world. Many mediums have started tearing down their own negative barriers with diverse and inclusive characters. Select panels at NYCC are tailor-made for just about every type of visitor, including fun and educational conversations about diversity and justice. Topics for Thursday alone included: “Girl Power Comics: Middle-Grade Fiction for Girls (and Boys),” “YogaQuest Presents The Legend of Zelda: A Narrative Yogi Experience,” “Representation Matters! How to Respectfully Write and Draw POC and LGBTQIA Characters,” “Content Literacy: Teaching STEM with Comics,” and special curated talks about readership in libraries, hosted by our very own NYPL. While there are still notable social issues to face in pop culture, the overall attitude among creators and fans is hopeful, optimistic, and compassionate. The vibe on Thursday was welcoming to say the least. I smiled at complete strangers (in Manhattan, mind you) and they smiled back! People were giving out random high-fives up and down the escalators for hours. I saw families of all sizes and backgrounds supporting one another; parents handing out allowances to their kids for Pop! figurines or enamel pins. Large groups of friends absolutely lost it while demoing a new game together for the first time. Individuals immediately lit up in the presence of their favorite comic-book artists, many to the point of tears. Another major draw to attend NYCC is witnessing the cosplay around you. Fans pay tribute to characters through cosplay, an embodied fashion statement of individual creativity across genres. Personalized DIY fashion and content reign as the best and most interesting kind of cosplay. On a single day I saw a beautiful young woman rocking a Disney princess version of a Star Trek character, a lone Eleven from Stranger Things wandering around with Eggos in hand, and the what looked like Elektra’s doppelgänger expertly posing outside like a Marvel comic book cover come to life. Top that, Paris Fashion Week. The most enchanting thing about NYCC is that you feel like you belong from the moment your badge is scanned. This direct sense of belonging touched me at my core. Like so many young girls with brothers growing up in the ‘90s, I always felt torn between the characters I loved: Belle and Rogue, Ariel and Buffy, princesses and superheroes, fairies and zombies. Everything my brothers and I were interested in conflicted, which made me feel like an outsider. Year after year, children—especially young girls—are taught to follow strict social norms that limit creativity and individuality. 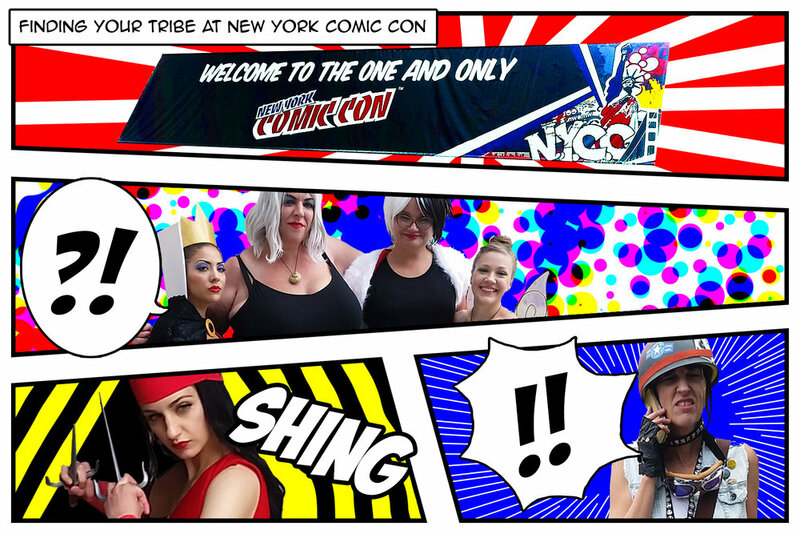 When you’re at NYCC, there’s an overwhelming amount of support to explore yourself and find your tribe. You can proudly be anything you’ve ever wanted to be all at once—if only for three marvelous days.